Unique Applique Christmas Tree Skirt, "In Bethlehem"
A star hovers over the stable in Bethlehem where little Jesus sleeps in a manger filled with hay. On a hillside, shepherds listen to the angel's story and the Three Kings are on their way to worship the Christ child. Balvina Huaytalla celebrates the holiday in a delightful hand-made Christmas tree skirt whose images span time and space. Each tiny figure is crafted in three dimensions and embroidered, in the traditional Andean art of arpillería (patchwork). 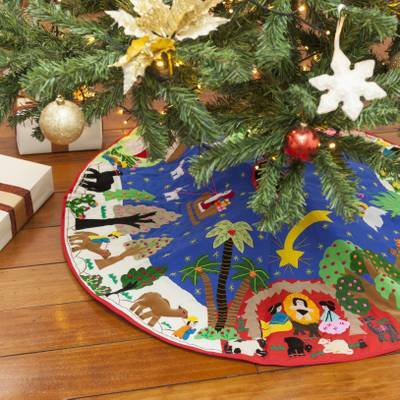 I had been looking for a unique tree skirt until I came across this one and just had to have it! The craftsmanship is perfect! I love to just look at it, all the different parts.